The water moves along nicely, yet it’s no raging torrent. During spring runoff, the water surface will get a bit wider but not spread out as far as most rivers. This kind of stream keeps extra flow right within its channel — just getting deeper — much more often than most streams. The rapid-dominated river is neither calm nor savage, neither too much nor too little… okay you get it. 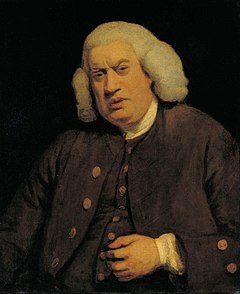 And here is a picture of Dr. Johnson that you can also study: As an advertisement for moderation, he may inadvertently promote..
Aha! Haven’t we always suspected there’s more going on behind those intellectual glasses, just based on Nancy alone? So what’s a stream to do? Naturally, you don’t want to destabilize when confronted with life’s changes .. but is moderation the only strategy for success? Often your favorite immoderation really brings you alive. Indeed, it’s part of your original medicine, your unique mix of gifts and talents that only you can bring to this world. Never fear. Some pretty fantastic rivers are famously immoderate and they have agreed to advise you. Send me an email or comment describing YOUR trademark excess. I’ll forward your letters to my favorite healthy-and-wild streams, then post their responses: real-world perspectives on how you can live the life resilient plus enhance everyone’s journey with your own delightful alternative to moderation. This entry was posted in Uncategorized on February 12, 2011 by Betsy. I’m so glad you were my first:) And that you spotted your word — I thought of you as I typed it. I know just the river who will thrill to be THE FIRST ponder-er of a reader immoderation! LOVE (not like) this, Betsy! My greatest fear is of stagnation, which encourages me to flow quickly and unceasingly. I need to slow down some any recomendations dear rivers? Ah, Betsy! You just inspired another painting idea! I have begun to sketch a series of leaf portraits and floating on a river brings an entirely new element to my thinking (quite literally – water!). And simply the thought of another series- painting portraits of different bodies of water (trying to capture their fluid souls – what fun!) has me excited! Would love to read your response to Hatt – somewhat selfishly, too, as I also fear stagnation. But I also fear impotence or a living life without fully grasping it’s richness and meaning. What say the rivers about such things? Paintings of rivers’ fluid souls… LOVE. I also really want to hear what you think about the fresh post on stagnation (not an oxymoron I think!). It is different. Meanwhile, I am going to find the right river to ask about your second point. I so appreciate your comments, Leah.